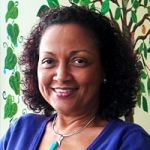 Since graduating with a Masters Degree majoring in Maternal-Child Health from Columbia University in 1986, Debrah has worked in public and private practice midwifery in New York, Africa and Trinidad & Tobago. She is a founder and current Executive Director of Mamatoto Resource & Birth Centre in Trinidad where she remains in active midwifery practice. She is on the Board of the North West Regional Health Authority; works with the Nursing Council; and serves as an independent consultant on midwifery matters. Debrah precepts students from the USA, Canada and Europe, and has presented extensively regionally and internationally, including a TEDx Talk on fathers. She was the International Confederation of Midwives (ICM) Americas Board Member from 2005 – 2011 and Vice-President from 2011 - 2014; a founding member of the Trinidad & Tobago Association of Midwives; and spearheaded the formation of the Caribbean Regional Midwives Association in 2012. Debrah is the recipient of several awards including the Dorothea M. Lang Pioneer Award and a National Award for The Development of Women – Gold – for her work in Community Service and Midwifery in Trinidad & Tobago. Traditionally, health care services target mothers – and engaging fathers has generally been overlooked. As a result fathers feel excluded and unsupported. However, there has been growing recognition of the importance of parenting partnerships and fathers’ contribution to children’s development. As a result services are becoming more conscious of this. In a recent survey midwives agreed that including fathers is a part of their role but generally did not feel educated or well prepared to do this. Individual providers and maternity care services must review the care they provide to assess their policies and resources, for example, and how they promote father and family inclusive care.